Article first published as Blu-ray Review: 'Westworld: Season One' on Blogcritics. Westworld is, in my opinion, the best new show of 2016. Based on the Michael Crichton film of the same name, it’s a high-concept series about an advanced theme park populated by super sophisticated robots. But as in Crichton’s classic Jurassic Park, the creators of the place can’t control what they’ve built and things go very wrong. That is only the start of the story, which explores sentience, humanity, morality, perception, and so much more. Why do I bring up this show now, a year after it aired? Because with season two scheduled for 2018 on HBO, Westworld: Season One: The Maze is available now on 4K Ultra HD, Blu-ray, DVD, and digital, just in time for the holidays. It’s hard to talk about too much without giving away the brilliant twists, so I’ll only describe the setup in the broadest of terms. The characters in Westworld can be divided into three categories: the robots, the park workers, and the guests. Right away, there is some blurring of the lines between the divisions. In general, though, the guests are interacting with the robots in the park (which shares a name with the show). The workers try to keep things running smoothly, and address any glitches that come up. Behind-the-scenes, founder Dr. Robert Ford (Anthony Hopkins) is nearing retirement. The board that runs Westworld would like to see him pushed out. His protege, Bernard Lowe (Jeffrey Wright), supports him, but has his own concerns to deal with. Namely, that some of the robots are beginning to have memories they shouldn’t, and act in ways contrary to their programming. The park has been around for decades, and there are hints that this isn’t the first time something like this has happened. At the same time, things within the park are just as chaotic. The Man in Black (Ed Harris), a frequent guest over a long period of time, is looking for the entrance to the fabled Maze. He believes this will allow him to enter a higher level of the game, and he is obsessed with finding everything the park has to offer. Is he right? And if he is, what does this mean for those that dwell within the programmed scenarios? Westworld is full of fantastic actors. Hopkins and Wright are terrific, of course. Luke Hemsworth, Sidse Babett Knudsen, and Shannon Woodward also play employees with varying motivations for their presence. Jimmi Simpson and Ben Barnes are guests, which provide an entry point for the audience. This is especially true of Jimmy, whose William is there for the first time. To the credit of all of the above, they can compete with the robots for attention. The humans also are just as complex as the non-humans, which makes for a busy show. While the guests may be relatable, the artificial constructs are probably more interesting to most viewers. Evan Rachel Wood outdoes herself in her intricate portrayal of Delores. She is the oldest robot in the place, and one who begins experiencing issues. She is joined by Thandie Newton, James Marsden, Ingrid Bolso Berdal, and Angela Sarafyan, among others playing artificial life forms. Their task is not an easy one, finding a way to portray life awaking within machine. Yet, across the board, they deliver impressive performances. Quality is maintained in every aspect of the production, from the writing to the set design to the location shoots to the scoring. Just as great care for attention to detail would be taken in the real Westworld, it is on this show. Breathtaking vistas mixed with unique sci-fi elements make for a really interesting overall world. It is a pretty immersive experience to watch. For some releases, featurettes dispel a bit of the magic. Showing us the nuts and bolts behind the creation is interesting, but can demystify. Westworld: Season One provides that, but somehow, pulling back the curtain only makes what’s been done more impressive. As we hear about the creation of the look, the title sequences, and filming in those sweeping landscapes, it hits home just how much went into this program. Combined with some bits on the premise and actors, as well as a light gag reel, there’s a lot here, most of it solid. Westworld: Season One also includes “The Big Moment” featurettes that often air right after the episodes. This is a good idea because it breaks down key moments in the series one at a time. Spreading them across the discs is smart, too, because they appear where they will be easiest to access. In fact, where all the extras are spread is well thought out, making for a nice, enhanced viewing experience. It will come as no surprise to you that I recommend this set. Everything about it is neat, and rewatching it only builds anticipation for the show’s return. This is a series that begs repeat viewings to fully grasp it, so owning the set is helpful for that purpose. With solid bonus material, it makes it worth going beyond just rewatching the streaming episodes. This is a great release, and one I am happy to add to my shelf. My only regret is that I don’t yet have the capacity to watch it in 4K Ultra HD, which I will definitely do in the future. 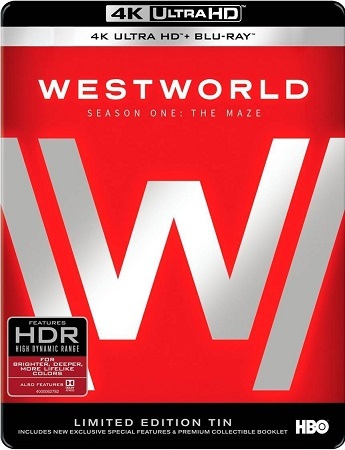 Westworld: Season One: The Maze is available now.